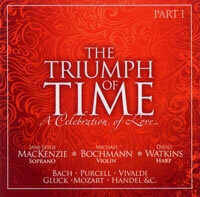 ..:: David Watkins :: CD The Triumph of Time P1::..
Part 1 of 2. These two CDs contain songs and arias which embrace all aspects of love - or even the lack of it, as in Byron’s chill words ‘To the Moon’ (An den mond) and set for harp accompaniment by Schumann. Purcell was one of the greatest composers of the Baroque period and one of the greatest of all English composers. Much of his theatre music consists of songs and instrumental pieces for spoken plays, but during the last five years of his life Purcell collaborated on five ‘semi-operas’ in which the music has a large share, with ‘divertissements’, songs, choral numbers and dances. Music For Awhile (from Oedipus) Music for awhile shall all your cares beguile. I attempt from Love’s Sickness to Fly in Vain from The Indian Queen – a ‘semiopera’ written by John Dryden and Sir Robert Howard. Dido’s Lament from Purcell’s only true opera, ‘Dido & Aeneas’ which was written for and premièred at Mr Josiah Priest’s Boarding School for Girls, Chelsea, London in 1689. This aria makes a huge emotional impact like Wagner’s Liebestod from Tristan and Isolde. Bach’s solo violin works, forever fascinating, present musical and technical challenges for the violinist. This largo’s beautiful melodic line is harmonised with simple ‘doublestopping’ and the energetic Allegro, although, written on one line, subtly hints at counterpoint and contrasting rhythms. Pieta Signore Have mercy on me Lord and do not judge me too harshly or condemn me to the everlasting flame. There is now much speculation that this, Stradella’s most famous aria could not have been written by Stradella and was more likely to have been composed by Fétis, Niedermeyer or Rossini! In this aria, Michael Bochmann plays a viola. Se tu m’ami (text by Paolo Antonio Rolli 1687-1765) Current thinking is that this song was actually composed by Alessandro Parisotti 1853-1913, and passed off as a song by Pergolesi! yet I delight in your love for me! Only you in return, you’re sadly mistaken. doesn’t mean I have to despise all the other flowers! Youth blazing in my heart. You pinch me, you bite me. Alas, what is this thing? That you make me despair! To breathe the air that you breathe fills me with longing. I seek for you, call for you, I hope and sigh. Created in the flames of passion, I give you back to the flames, for you were not written for me alone. You burn now and soon there will be nothing left of you. But oh, the man who wrote to you will burn for a long time in me. It is evening, the sun is sinking and the moon is shedding silver light. Our play is over and the curtain comes down on life. The tears of friends flow already over our grave. But don’t be ashamed to weep, for those tears will become the fairest pearls in my crown. When love shines from those bright, blue open eyes of yours, my heart skips a beat and I have to grab you and kiss your warm red cheeks. Darling maiden! I clasp you firmly to my breast and will only release you if death comes to claim me. Then my intoxicated gaze is overshadowed by a gloomy cloud and I have to sit, exhausted, but blissful, next to you. Sonata in C for violin and harp Originally written as a trio for violin, lute and bass, I transcribed it for violin and harp when I was a student in Paris. There are three movements, Allegro Non Molto, Larghetto and Allegro. The sonata is typical of Vivaldi’s style. Astringent and rhythmic fast movements frame a slow movement of haunting beauty. Ombra mai fu The Largo from the opera Xerxes. A love song, sung by the main character to the tree under which he sits, enjoying its shade. O Had I Jubal’s Lyre from the oratorio Joshua which was composed between 19 July and 19 August in 1747, and first performed in March 1748. It was Handel’s fourth collaboration with the librettist Thomas Morell. Lascia ch’io pianga from Rinaldo. Rinaldo was the first opera Handel produced for London and the first Italian opera composed specifically for the London stage. It was first performed in Her Majesty’s Theatre in Haymarket on 24th February 1711. Leave me to weep over my cruel fate And leave me to long for liberty.In this aria, Michael Bochmann plays a viola. Tu del ciel ministro eletto from II Trionfo del Tempo (The Triumph of Time). This oratorio was written in 1707 when Handel was only twentytwo years old. It is a spectacular combination of poetry and virtuosity and deserves to be better known. In this, the final aria the violin obbligato was written especially for the great violinist Corelli. Interestingly, the sarabande aria for the character Pleasure in this work, (‘Lascia la spina’) which is based on an earlier piece by Handel, later became the famous aria Lascia chi’io pianga from Rinaldo included on this CD. You, the high minister of Heaven, shall see no more in my heart a faithless wish or empty craving. For though I once lived unmindful of God, I now bring Him a heart made new. Recording and editing: Paul Arden-Taylor www.dinmore-records.co.uk DDD 24-bit.